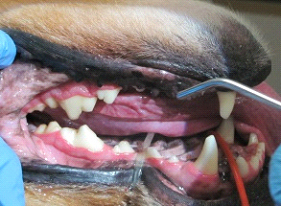 What is the importance of pet dental health? Every day plaque is deposited on the teeth. If they are not brushed daily, the bacteria causes inflammation that result in bad breath, loss of bone support, formation of pockets, root exposures and ultimately, loss of teeth. Periodontal gum disease is infection resulting from build-up of dental plaque on the surfaces of the teeth around the gums. The bacteria in dental plaque irritate the gum tissue, which leads to infection in the bone surrounding the teeth. All dental procedures are performed under complete general anesthesia! ♥ Pre-surgical examination to ensure that your pet is healthy to go under anesthetic. ♥ Pre-anesthetic blood testing is preformed to ensure that your pet can properly process and eliminate anesthetic agents. These tests confirm that your pet's organs are functioning properly, and can reveal hidden health conditions that could put your pet at risk. ♥ An intravenous catheter is placed to maintain access during the procedure in case of complications. It also allows us to administer fluids through the vein to maintain blood pressure (anesthesia can lower blood pressure) and help flush any harmful bacteria out of the blood stream. ♥ Pre-anesthesia medication is administered before anesthesia to relieve anxiety and decrease pain, making the complete anesthetic experience as smooth as we can for them. ♥ Next your pet will undergo dental/oral examination. We pass a probe around each tooth to evaluate the disease below the gum line and take note of any abnormalities within the oral cavity itself. 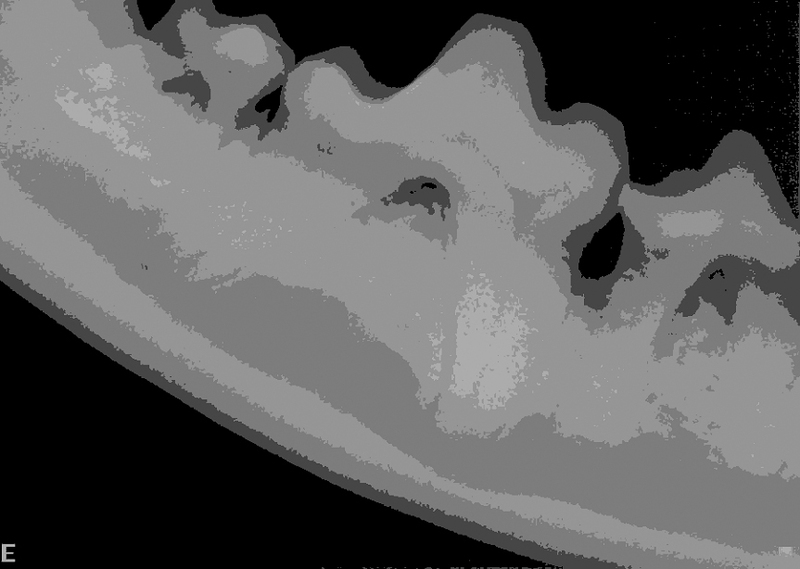 ♥ Digital dental x-rays are then preformed to evaluate the root and ligaments of the tooth below the gum line, as we can only visibly see 1/3 to ½ of the tooth. ♥ If extractions are required the mouth is blocked (frozen) to decrease post dental pain associated with these extractions. Locations where teeth will be extracted are cleaned and prepared for removal; this includes making “flaps” of gum to be sutured over the site of removal that reduce the chance of infection and pain associated with the common term “dry socket”. ♥Scaling of the teeth to remove tartar and plaque is performed with both electronic scalers and hand scalers. Then a curette is used below the gum line to remove the most harmful plaque and tartar deposits. This plaque and tartar is the cause of periodontal gum disease and tooth loss. Polishing the teeth is the last step and is important to smooth the surface and decrease the adhesive ability of plaque. ♥Each pet that undergoes a dental procedure will receive antibiotics by intravenous administration. Antibiotics, pain medications and anti-inflammatories are dispensed for at home use based on severity of dental disease and the procedures associated with the procedure. ♥Ten days after the dental procedure your pet returns for a complimentary dental assessment. At this time we assess the healing of the gums and oral cavity. You are shown how to brush the teeth and given samples of foods and treats that will help the brushing to decrease the development of dental disease causing plaque. ♥Three and six months after the procedure you will receive a call to schedule a complementary appointment to ensure that the prevention plan that we have been using is working. If not, we will make changes appropriately. 80% of dogs and 70% of cats by the age of 3 year will have some form of dental disease, prevention is the key! An important way to prevent dental disease is regular home dental care. Daily brushing can help remove plaque before it turns into tartar. We recommend starting this procedure as puppies and kittens with massaging their teeth/gums daily and turning that into brushing with an appropriate tooth brush once their adult teeth have arrived at approximately 6 months of age. There are several dental diets and treats that can also help keep plaque and tartar to a minimum. These diets tend to have larger kibbles to provide abrasive action against the tooth surface when chewed, or they may include ingredients to inhibit tartar formation. Ask us which dental diets or treats are best for your pet.